As a companion piece to my article Top 10 Best SummerSlam Main Events of All Time, I've also decided to take a look at the worst main events in the pay-per-view's history. The matches on this list aren't all bad matches, but they just didn't meet the same level of excellence as the best main events did. Without further ado, here are the top 10 worst main events in SummerSlam's history. The first match on our list occurred during John Cena's year-plus reign as the WWE Champion. Having already beaten Shawn Michaels, Edge, Bobby Lashley, Umaga, The Great Khali, Mick Foley, King Booker, and even Randy Orton (in a Fatal 4-Way), Cena was running out of challengers. Insert Jonathan Coachman, who announced on Raw that Randy Orton would be John Cena's opponent after an impressive showing earlier in the night. Meanwhile, Randy Orton had been on a path of destruction in his own right, annihilating legends the likes of Sgt. Slaughter, Dusty Rhodes, Rob Van Dam, and once again, Shawn Michaels. The match ran for a little longer than 15 minutes, giving Orton plenty of time to shell out some ferocious offense. While it was interesting to see these two have a clean match (since most of Orton's later wins over Cena have been through some sort of cheating), it was clear from the onset that Cena would walk out the victor. The match was too basic as WWE used the typical Cena gets beat up and then makes a comeback for the win formula, making Orton seem like nothing more than the next victim. Going into the SummerSlam main event, the Nexus were an unstoppable force. They first appeared on seen, obliterating everything in sight at the end of Monday Night Raw, and when I say everything, I mean the wrestling ring included. Basically, they were the cast of NXT's first season with the season's winner, Wade Barrett, acting as their commander-in-chief. The Nexus interfered in pay-per-view matches, battered wrestlers backstage, and had full WWE takeover in mind as the end goal. Of course, none other than John Cena stood up to them. He rounded up a crack team of WWE main eventers (Edge and Jericho), mid-carders (Morrison and R-Truth), a glorified jobber (the Great Khali), and a retired legend who's best days were behind him (Bret Hart). With egos and tensions running wild, Jericho and Edge abandoned the team, while the lone wolf, Khali, called out the Nexus on his own. A hyena-like Nexus beat down Khali backstage, effectively removing him from the match (thank God.). 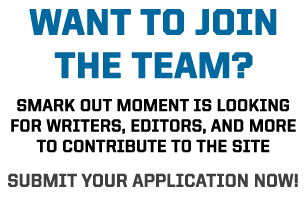 Out of necessity, Jericho and Edge returned to the team when they realized Nexus wouldn't spare them anyway. Going into the event, a team of six WWE veterans answered the call to arms against the seven former NXT rookies. Prior to beginning their elimination tag match, the Miz showed up and tried to take the seventh spot, but Cena rebuked him, and announced that former Nexus member, Daniel Bryan, would be the final squadmate of the WWE resistance. The match started off great for WWE with Tarver and Young being eliminated before having the opportunity to truly showcase any of their talent. After that, it mostly consisted of back and forth eliminations between the two teams. 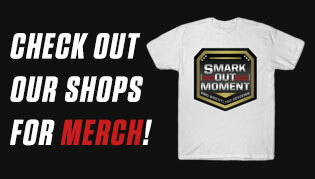 On the Nexus side, Sheffield and Slater looked the best, while Barrett barked orders, and Otunga and Gabriel jobbed. Bret Hart shouldn't have been in this match with it being clear to everyone that he wasn't half as athletic as he once was. R-Truth and John Morrison possibly could've been replaced with main eventers as well. 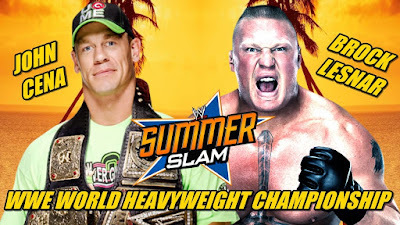 When Cena made Barrett tap out to the STF, he ended what was just warming up to be one of the best angles in WWE's recent years, placing this match on the list of worst SummerSlam main events. Last year's SummerSlam main event was far from history's best with a generic build-up, odd promo, and a squash match to boot. In Paul Heyman's defense, he did a great job as a hype machine, but it all came down to Brock Lesnar wanting a title shot for destroying Triple H, Shawn Michaels, Mark Henry, and Big Show. Cena's promo work was solid and even inspirational in a cheesy kind of way, whereas Lesnar's talking just stood as another reminder for why he has Paul Heyman at his side. As I already said, the match was a squash, which a SummerSlam main event should never be. Lesnar performed countless suplexes recklessly on Cena and no-sold an STF. Cena acted as a breathing rag doll and ate another F5 before Lesnar claimed the belt. It upsets me to throw this one on the "worst" list because elimination chamber matches are my favorite match type. Unfortunately, this just wasn't the best main event, nor was it the best elimination chamber match. As an authority figure, "Stone Cold" Steve Austin booked these six participants in this match. The competitors faced off in the pending weeks with Goldberg appearing to be the primary threat to Triple H's title. Fellow Evolution stablemate, Randy Orton, was there to have Triple H's back, however it didn't help much during the match. The main event saw Y2J and HBK put on a good show to start things off. Orton came in to the match and took a beating. Nash came in and was eliminated in no time at all. Goldberg's pod opened and he pinned Orton, Michaels, and Jericho in a matter of minutes. It doesn't make much sense for him to lose after showing such dominance, but somehow Triple H gets a sledgehammer and whacks Goldberg in the back of the head for an easy victory. It was a terrible idea to have three of the company's biggest stars job to Goldberg with such ease, and to have there be no actual wrestling between Triple H and Goldberg. Now we're getting to the legitimately bad matches. 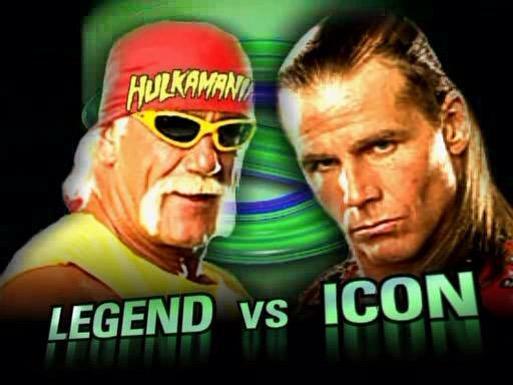 Billed as "the Legend meets the Icon", this had all of the makings for a famous historical encounter. On the surface, HBK called out Hogan for a match after superkicking him to which Hogan accepted. Due to backstage politics however, this instead became quite infamous for the goofy presentation at the 2005 SummerSlam main event. In a nutshell, Hogan and Michaels were initially supposed to trade wins with Hogan winning at SummerSlam and Michaels picking up the following victory. Last minute, Hulk Hogan, being the diva that he is, decided he didn't want to put over Shawn Michaels. How did Shawn react? Did he wrestle stiff? No, quite the opposite, in fact. HBK did a fantastic job of overselling every single one of Hulk Hogan's moves in this match, bouncing from one side of the ring to the next. The best part was when he took the big boot from Hogan. Because this match was so goofy it was entertaining, it's not number one on this list. Lex Luger bodyslammed Yokozuna when other wrestlers couldn't, so he became the number one contender. That's about it story-wise. While this match was decent, I really want to know who thought it was a great idea to end a "Big Four" PPV by count-out. Mr. Fuji was already interfering the entire match. Couldn't they have just had him somehow cost Luger the title? WWE should never end a PPV with a disqualification, no contest, or count-out finish, let alone at a PPV as significant as SummerSlam. This feud started when King of the Ring winner, Mabel, attacked Diesel during his lumberjack title defense against Sycho Sid. However, Diesel won the match, and then continued to feud with Mabel in the weeks approaching SummerSlam. At one point, he defeated Mabel’s cohort, Sir Mo, only to receive a post-match beat down from Mabel anyway. Davey Boy Smith later offered his services to Diesel as a tag team partner, and although the two faced off against Men on a Mission (Mabel and Mo), Smith betrayed Diesel, leading to a three-on-one assault right before SummerSlam. Given their sizes, Diesel and King Mabel did what they could with this main event, but man, was it a slow match. If only this bout had two agile big men, like Undertaker and Lesnar, perhaps. Also, despite Smith's recent heel turn, he was nowhere to be seen in this main event. Thankfully, this match was under 10 minutes, but I swear, it felt like 25. Continuing their WrestleMania rivalry, Hogan was set to face Sgt. Slaughter and his lackies in the main event of SummerSlam. 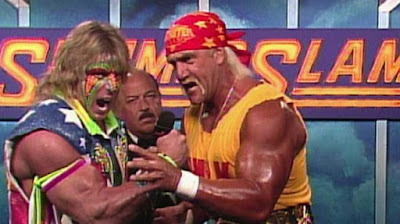 Ultimate Warrior came to Hogan's aid, balancing the the face-heel ratio slightly more, and Sid Justice was publicized to be the guest referee. With Hogan and Warrior being as dominant as they were, and the heel side having an additional man, it seemed like this could be an interesting match. Regrettably, this match was slow-paced because the heel side lacked any sort of agility. Slaughter easily saw most of the action for his team, while his cohorts were close to useless. Warrior chased Mustafa and Adnan out of the ring in part because this was his last match for the WWF for a while (due to alleged threats to McMahon over money owed for WrestleMania). 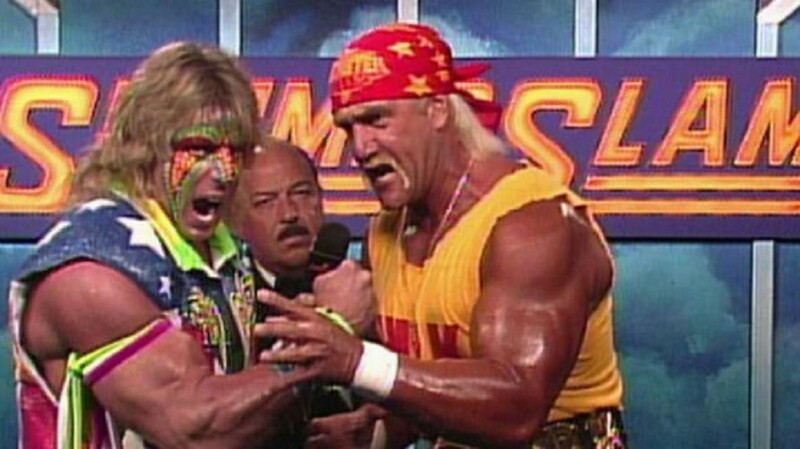 It was nice seeing Sid Justice celebrate with Hulk Hogan to make up for Warrior's absence, but the match itself simply wasn't that entertaining. While this was the final match, there was a wedding ceremony shortly after between Miss Elizabeth and Randy Savage that kind of made up for the poor main event. Just gives you the feels. 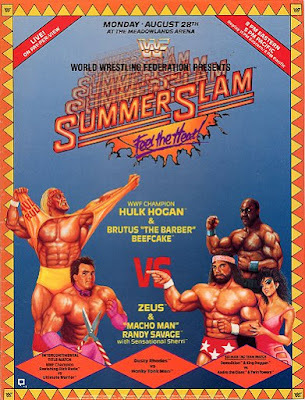 Subsequent to Hogans' victories over Zeus (as Rip, in the film, No Holds Barred) and at WrestleMania V over Randy Savage, Zeus and Savage teamed up to assault Hogan and his ally, Brutus Beefcake. The ridiculous move tie-in steered these four towards a SummerSlam tag team finale, and it was upstaged by the night's earlier Intercontinental Championship match between Ultimate Warrior and Rick Rude. From the onset, it was mightily apparent that Zeus (Tom Lister) was not a professional wrestler. As the active man, Zeus mostly executed bear hugs and forearm clubs, both of which required little athleticism when compared to the others' body slams, diving attacks, reversals, etc. He was tagged out pretty quickly to mask his weaknesses, which was a smart move on WWF's behalf, though he came back in a couple of times. In a goofy moment, the ref was choking Zeus for choking Beefcake. Sensational Sherri had a good manager moment as she pulled Hogan's leg while he attempted to suplex Savage, nearly resulting in Hogan being pinned. Hogan did a fantastic job of removing credibility from Savage's diving elbow drop when he completely no-sold the move. Closing out this laughable contest, Hulk Hogan hit Zeus with Sherri's purse and a leg drop, chalking up another win for the good guys. The build was odd for this one. Over the course of a few weeks, Chyna was the number one contender, then Chyna was confirmed as the number one contender, Mankind became the number one contender, and then Mankind and Triple H were both the number one contenders. Triple H was ridiculously sexist towards Chyna during the lead-in work, stating that she more or less shouldn't receive a title shot since she's only a woman. Given that Chyna won two number one contender matches, I thought it would've made more sense to let her main event against Stone Cold. But this is WWE we're talking about here, so instead Mankind and Triple H faced Stone Cold in a triple threat match with Jesse Ventura as the ref for some reason. It was clear that no one expected Mankind to come out on top of this one. Triple H collapsed after performing the Pedigree on Stone Cold, leaving him susceptible to Mankind's double underhook DDT. Ventura was fun as a guest ref when he not only ejected Chyna from ringside (It made no sense for her to stand by Triple H anyway. ), but also refused to count the pin after Triple H used a chair. This wasn't really a bad match. It just didn't stick out amongst SummerSlam's better matches. Lesnar broke Triple H's arm some time before. A returning Triple H wanted revenge, and these two were scheduled for another big name match. During the build-up, Lesnar also "broke" the arm of Triple H's friend, Shawn Michaels, amping Triple H up further for their match. This time it was personal. 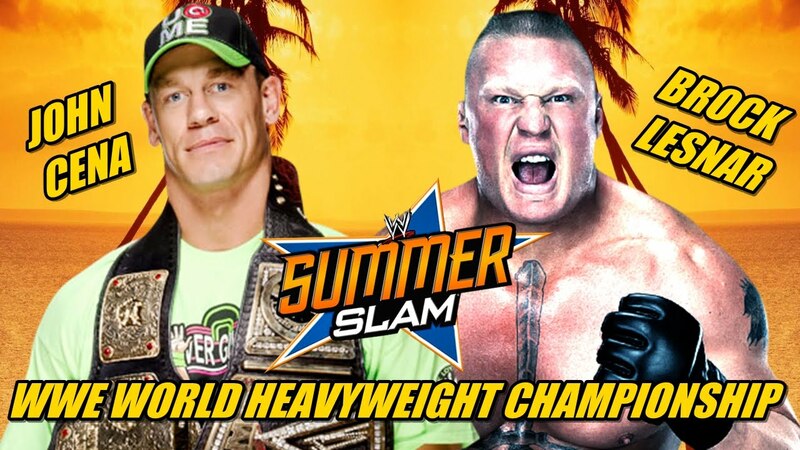 While better than Lesnar's SummerSlam face-off with Cena, this match was still pretty dull. The in-match story was straightforward: Lesnar previously "broke" Triple H's arm, so the heel Lesnar worked Triple H's arm the whole match. That's about it. The match ended with Lesnar once again no-selling his opponent's finisher, and Triple H was forced to tap once more to the kimura lock. In the finish of a casket match with Yokozuna, Undertaker was rolled into the casket, "killing" him in the process. A vengeful Undertaker vowed to make his return to the WWF, and he did so for this garbage match. Random people all claimed that they saw Undertaker, while Ted DiBiase had the nerve to bring back a fake Undertaker. Paul Bearer called BS on his claim, going to a graveyard to summon the real Undertaker. With the real Undertaker showing up right before SummerSlam, he promised to make his dopplegänger "rest in peace". Why this was the main event over the phenomenal cage match between Bret and Owen Hart, I'll never know. This whole concept was frankly quite stupid, and was probably the inspiration for the equally-bad Kane vs. Imposter Kane rivalry that occurred years later. To make matters worse, Fake Undertaker botched most of the few moves he made. 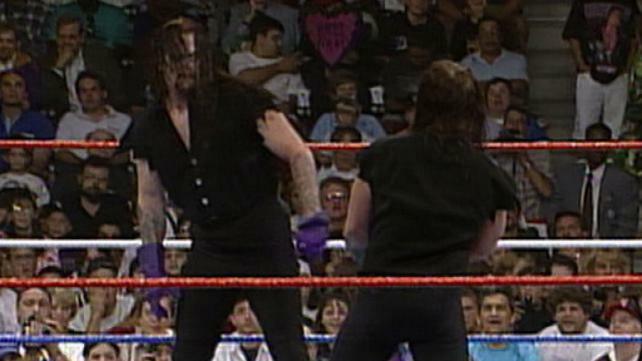 I loved the solid Tombstone Piledrivers from the real Undertaker at the end, but this match was just a drag. I don't get why the casket at the beginning just stored the urn as opposed to The Undertaker and the urn (Undertaker showed up at the entrance ramp). Finally, I couldn't decide whether Leslie Nielson playing the part of a detective was funny or stupid, but it happened anyway. Do you agree with my list? Leave a comment below and let me know what you think the top 10 worst SummerSlam main events are. Thanks for reading!